Cast Glass is different than blown or lampworked glass. Not only is the process different ... the result is different. Cast glass has a more solid feel, it has weight. Blown glass can be beautiful, elegant, delicate ... but it doesn't have the gravitas of cast glass. Only a bus-full of people, globally, are proficient at glass casting in its advanced form ... which, for me, is the one that uses the lost-wax kiln-formed process. It's extremely time-consuming, labor-intensive, and exacting. 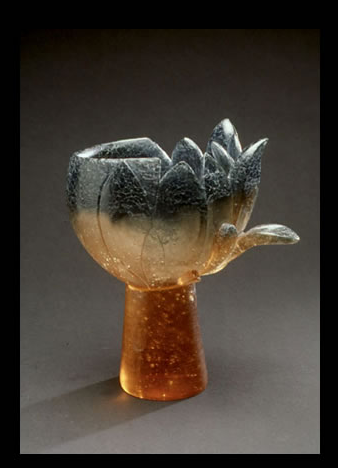 Japan & the Czech Republic have a relatively large handful of studio artists doing excellent work in cast glass. In North America, there are only a few real standouts, and I'll try to describe the work of one of them, Olga Volchkova. She has an understanding of the strength of the medium, and she brings life to the material. I'll try to describe how.